"We fit any occasion, stage and any budget"
If you are looking for something different with a special touch for the most important day of your life, you'll want know more about us. We are a full service entertainment production company servicing Florida, Georgia and South Carolina based out of Jacksonville, FL. We bring over 30 years of the entertainment business to you. Customers that choose us are looking for something different and or wanted music that everyone would enjoy from the Grandparents to the children so everyone has a memorable experience. 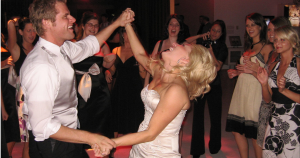 Let us put an entertainment package together for you from your rehearsal dinner to your ceremony to your reception. We have acts as compact as a solo to a full band. Our clients compliment us the most on how easy we are to work with and how we performed such a wide variety of music. Debi and Ernie Evans have been married for over 33 years! 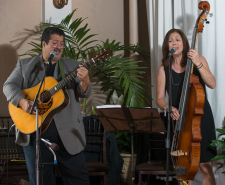 We have had many request for specialty themed services like Bluegrass, Jazz or Blues. Make your Rehearsal Dinner fun and memorable but most of all, unique. Have you considered Mandolins? Have all of they elegance of a violin quartet for considerably less cost. Mandolins are some of the most beautiful sounding instruments in the world today. Enjoy our large library of songs or ask us about our special request program. We will learn your hand selected song for a minimal charge. Choose material from the 1940's, 50's, 60's. 70's to today's popular tunes from Lady A, Zac Brown Band and more..